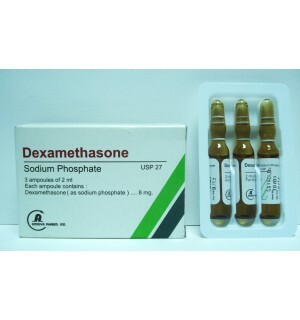 Dexamethasone sodium phosphate (equivalent to 8 mg Dexamethasone). hydrocortisone and other related derivatives. high-dose therapy in conditions where fluid retention would be a disadvantage. – Primary or secondary adrenocortical insufficiency. – Acute adrenocortical insufficienc . – reoperatively, and in the event of serious trauma or illness, In patients with known adrenal insufficiency or when adrenocortical reserve is doubtful. exists or is suspected . – Hypercalcemia associated with cancer. – Synovitis of osteoarthritis . – Rheumatoid arthritis, including juvenile rheumatoid arthritis (selected cases may require low-dose maintenance therapy) . – Acute and subacute bursitis. – Acute gouty arthritis . – Severe erythema multiforme (Stevens-Johnson syndrome). – Seasonal or perennial allergic rhinitis. craniotomy, or head injury . – Discoid lupus erythematosus . – Necrobiosis lipoidica diabeticorum . – Cystic tumors of an aponeurosis or tendon (ganglia). – Hypersensitivity to any component of the product . requires that the anticipated benefits be weighed against the possible hazards to the mother and embryo or fetus. Therapy with corticosteroids should be used with great caution after a recent myocardial infarction . simplex for fear of corneal perforation. patients who are receiving corticosteroids and anticoagulants at the same time. and physiological activity, thus adjustment in corticosteroid dosage is required. therapy should be carefully followed. Osteoporosis ( long term use) . Impaired wound healing, erythema, increased sweating. requirements for insulin or oral hypoglycemic agents in diabetics. Anaphylactoid or hypersensitivity reactions, thromboembolism, weight gain, increased appetite. The initial dosage of Dexamethasone varies from 0.5 to 9 mg a day depending on the disease being treated. In less severe diseases doses lower than 0.5 mg may suffice, while in severe diseases doses higher than 9 mg may be required. Dexamethasone is generally administered initially in a dosage of 10 mg intravenously followed by 4 mg every six hours intramuscularly until the symptoms of cerebral edema subside. Response is usually noted within 12 to 24 hours and dosage may be reduced after two to four days and gradually discontinued over a period of five to seven days. 1 or 2 ml (4 or 8 mg) of Dexamethasone intramuscularly . when the affected joints or areas are limited to one or two sites. Dosage and frequency of injection varies depending on the condition and the site of injection. The usual dose of Dexamethasone is from 0.2 to 6 mg. The frequency usually ranges from once every three to five days to once every two to three weeks. A box containing three ampoules ( 2 ml ) . A box containing five ampoules ( 2 ml ) . Sigma-Tec Pharmaceutical Industries- Egypt- S.A.E.